On 23 November 1977, an armada of helicopters and aeroplanes took off from Rhodesian airbases and crossed the border into Mozambique. Their objective: to attack the headquarters of the Zimbabwe African National Liberation Army, where thousands of enemy forces were concentrated. Codenamed Operation Dingo, the raid was planned to coincide with a meeting of Robert Mugabe and his war council at the targeted HQ. It would be the biggest conflict of the Rhodesian Bush War. In this fascinating account, Ian Pringle describes the political and military backdrop leading up to the operation, and he tells the story of the battle through the eyes of key personalities who planned, led and participated in it. Using his own experience as a jet and helicopter pilot and skydiver, he recreates the battle in detail, explaining the performance of men and machines in the unfolding drama of events. 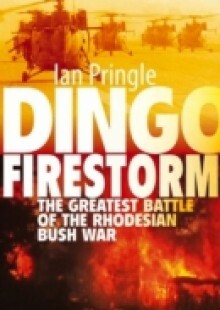 Dingo Firestorm is a fresh, gripping recreation of a major battle in southern African military history.